It's late and I can't seem to get the internet to work on my computer. So here I am on Paul's laptop at midnight trying to fit in my blog post for the week. All of my pictures are on my computer except for a few on my photobucket account. As I was searching I came across a pic of my little Layla. She was about a week old in this picture. 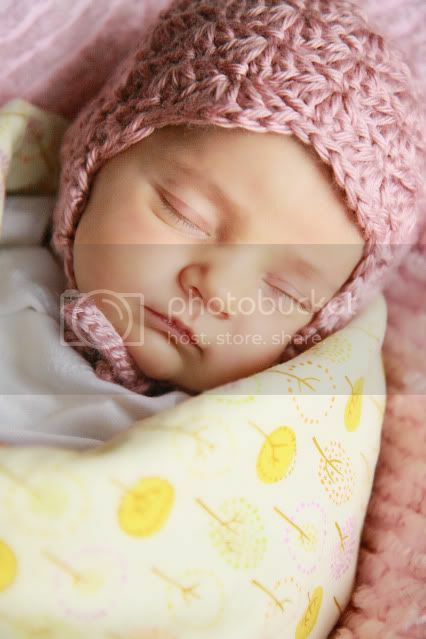 Before I took this I had tried and tried to get some cute newborn pictures of her. Envisioning her tiny and naked while posed perfectly as she slept. Yea right! Frustrated I went the the opposite extreme and bundled her up like an Eskimo. This picture ended up being one of my favorite photos of her. Oh how I love her! Every time I look at her I want to bite, chew, and eat her. That feeling is normal right! I think that feeling in normal because that it they way I feel too about Penny. I am so glad our kids are the same age. This is a darling picture. she is darling... i just love her! and I guarantee you made that little beanie bonnet, didn't you. So precious!